Fentanyl is a potent synthetic opioid that few Americans are unfamiliar with of late. The mixing of the strong analgesic with heroin is now commonplace, and in recent years the admixture is almost expected. Any prescription painkiller or illicit opioid can be deadly without the aid of fentanyl; but, when the drug is present in heroin the risk of overdose is exponentially higher. Opioid use carries many inherent risks, not the least of which is a substance use disorder. There is also a relatively high likelihood of exposure to infectious diseases (i.e., hepatitis C and HIV) for those who use opiates intravenously; such people are subject to skin infections as well, which can abscess and—left untreated—cause a host of health problems. Overdose, however, is perhaps the most significant cause for concern among individuals living with opioid use disorder. Around a hundred people die each day from an opioid overdose in the United States; with each year that passes, fentanyl-related overdose deaths become more and more frequent. While most people living with an opioid use disorder are somewhat familiar with the line between getting “high” and an overdose, when fentanyl is a part of the equation there is no way to gauge how much is too much. And, to make matters worse, people using opioids have no way of knowing that their drugs also contain a synthetic opiate. As a result of user ignorance, it stands to reason that lives could be saved if individuals have a method for screening their heroin for fentanyl; and, as a matter of fact, in some states, opioid addicts can access such a tool. Ideally, the more than two million Americans struggling with opioid use disorder would seek assistance in the form of addiction treatment; recovery is the best protection against overdose. Those who seek treatment tend to do so when they can access addiction treatment services, and when they are ready. Since everyone has a different "bottom," some people will continue down the path they are on for as long as possible before surrendering and asking for help. It is vital that those who are not ready for a new way of life have access to any tools that can prove life-saving, such as the overdose reversal drug naloxone and clean syringes to prevent disease transmission. The fact that naloxone isn't always effective on fentanyl, opioid addicts should have a method for detecting fentanyl in their heroin. The state of California public health department understands the need for providing addicts with life-saving tools and has begun paying for needle exchanges to distribute fentanyl test strips, The Los Angeles Times reports. No better time than the present it seems because the death toll from fentanyl in California tripled between 2016 and last year. 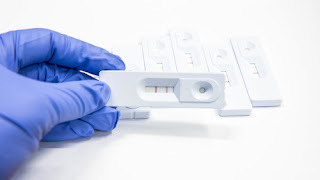 Similar to home pregnancy tests, users mix a dollop of their drug with water and place a test strip into the mixture, according to the article. In five minutes, the test strip reveals either one or two lines, the former being a positive sign. Users who are aware of fentanyl in their heroin can then adjust their dosage to better avoid an overdose. The test is meant for urine analysis; so, there isn’t a guarantee that it will work every time on drug matter, and there is the possibility of false negatives. Ken Osepyan, of the Pacific Pride Foundation—which manages needle exchanges in Santa Barbara County—says that 75% of heroin in the region contains fentanyl according to tests. Michael Marquesen, executive director of needle exchange Los Angeles Community Health Project, said that 40% of the heroin in Hollywood contains fentanyl. Fentanyl tests strips can save lives; research from Johns Hopkins University shows that 70 percent of users modify their behavior upon learning of the presence of the hazardous narcotic. Like naloxone, opioid users should have access to test strips; however, we must point out again that there are no guarantees, addiction treatment and recovery is the most effective way to avoid an overdose. Opioid use disorder recovery is possible with the right help; please contact Hope By The Sea to learn about how our program can assist you in leading a life free from prescription opioids and heroin.